An expert staff who will charm your customers. Can a robot take care of a customer? Will he understand his expectations? Will it be able to present your business in a best possible light? The answer to each of these questions is yes, of course. Our robots can be found in almost every customer service office. The software will be tailored to your business needs - together we will think of what your robot should be able to do. It is obvious that it will certainly have a huge knowledge, and it will be still able to acquire even more. Using the most advanced technology, Weegree One learns new, optimized responses with every contact with the customer. Find out how helpful and polite our robots are. People enchanted with robots - the research shows that practically everyone who gets to know Weegree One robots is delighted with them. Entrepreneurs ready for innovation – based on the information we collected, it is clear that almost half of the heads of companies are ready to introduce robots to their businesses. 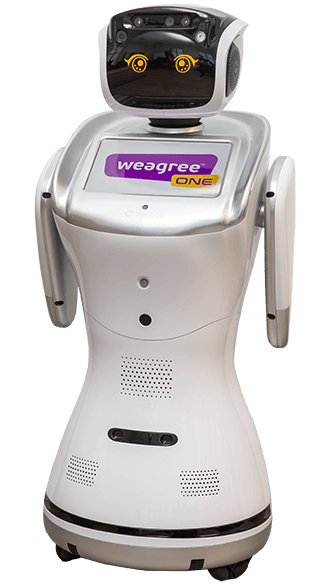 Satisfied Customers - By introducing the humanoid robot Weegree One to your company, you are guaranteed to be satisfied. The robot is equipped with HD and 3D cameras. Fully programmable, readable tablet which extends the range of robot’s applications. Technologically advanced proximity sensors prevent collisions with other environmental elements. Built-in subwoofer makes communication with people pleasant for the ear. Sanbot can recognize family members, friends and registered guests. With built-in projector, you can display materials on the wall. Sanbot not only recognizes speech, but also faces - it remembers the expectations of individual people, which enables it to quickly retain information and meet the needs of a recipient. It also makes possible the videoconferences owing to its built-in projector. You can communicate with him or her through a multimedia tablet. It is small, it moves very smoothly and without collisions. Its unique capability is face recognition. This makes it not only an excellent employee but also a great housework assistant - it can be an assistant for a particular person, can also be a member of the family. It can instantly attain knowledge, provide detailed information, take care of its owner. It impresses with its kindness and sense of humour. Sanbot is perfect to use in any place where your customers need to obtain any detailed information. 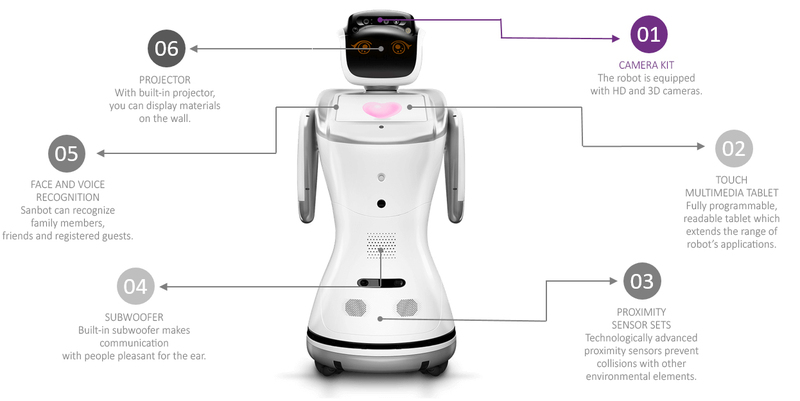 This means that Sanbot is perfectly suited to work as a receptionist – e.g. in a hotel, but also in any patients' clinic. It can as well act as a personal assistant, also for the elderly, whom it may remind of the necessary activities. If you have any questions about Weegree One please email us and we will contact you back immediately.